When it comes to choosing a retractable fabric awning for your home or business Samson offer an option for all sizes, requirements and budgets. 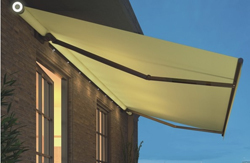 With 3 ranges, 29 models and 500+ fabric variations, there is an awning for everyone. Most are made to order, to guarantee a perfect fit, with a range of standard sized awnings also available. Learn more about our chosen manufacturers below. Automation is available for the majority of awnings we offer (manual operation optionally available), with most awnings using an RTS motor for wireless control and fewer cables. The RTS motor also makes the addition of any accessories easier, both immediately and in the future. At Samson, we only offer awnings that have been designed, tested and manufactured in Northern Europe, ensuring all awnings can withstand the notoriously mercurial UK weather. Many cheap awnings available in the UK are mass produced, only able to deliver a short lifespan in limited weather conditions. Choosing an awning from Samson ensures a reliability and assured quality, which is vital for something attached to your house or business. As a result, we offer a 5-year warranty on all motor drive units. With over 15 years experience in the awning market, the awnings we offer are chosen for their durability, high-quality finishing, and impressive fabric collections. 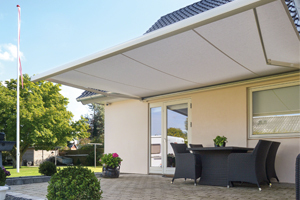 Markilux are a German manufacturer with the highest pedigree for producing fabric awnings and blinds, established as the pinnacle when it comes to awning systems. The Markilux range features a wide range of styles, all suited to cover a multitude of applications, with an emphasis on design and appearance. These are high-quality, good looking awnings, which we consider to the best that money can buy. Markilux awnings are always made-to-order, with a wide range of luxury accessories and sizes to choose from. 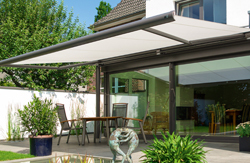 Weinor are another established German awning manufacturer, with a wider selection of outdoor living products also available, including glass roof systems and outdoor rooms. All products are made-to-order, with options including LED lighting, drop-down valances and heating also available. 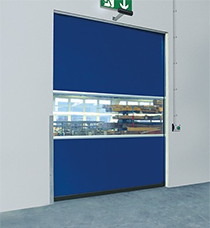 A wide range of factory finishes and cassette options make these awnings ideal for commercial applications. 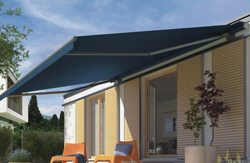 Verano are a Dutch manufacturer, producing a range of awnings, vertical blinds and aluminium roof systems. The awnings we offer from Verano deliver fantastic value for money, with a number of standard sizes available to buy instantly. Manual and electric operation can specified, meaning a Verano awning is versatile and well-suited to domestic and commercial applications. Whatever you requirements, we recommend you research carefully, as an awning is a lasting investment in your home. An awning can provide countless hours of enjoyment, and greatly enhance the value of your home for many years to come. Buying a cheap, mass-produced awning will deliver equally cheap results, costing more in the long run with repairs and replacements.